Buckley Industrial is now ISO9001:2015 accredited, one year earlier than required! 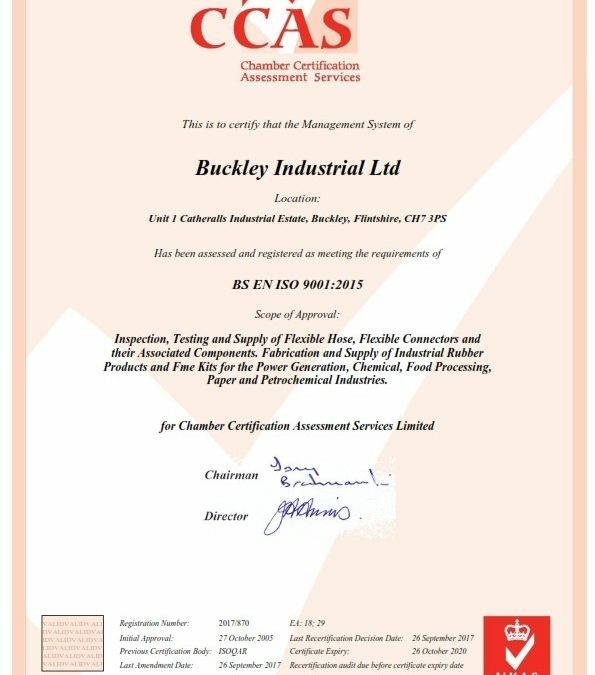 Buckley Industrial had previously been certified to ISO9001:2008 and has taken it’s accreditation seriously, first accredited to ISO9001 in October 2005. With the implementation of the newer standard 2 years ago, the management took the decision to upgrade. Being a hose risk management focused company, the transition to the new more risk based ISO9001:2015 accreditation was a logical step. Everyone in the company has a role to play in the quality system, and we were very pleased to receive the accreditation with no action points at the first attempt. This is a great result for Buckley Industrial and Quality Manager Anne Dransfield. To check our certificate please click here and enter our certificate number 2017/870.